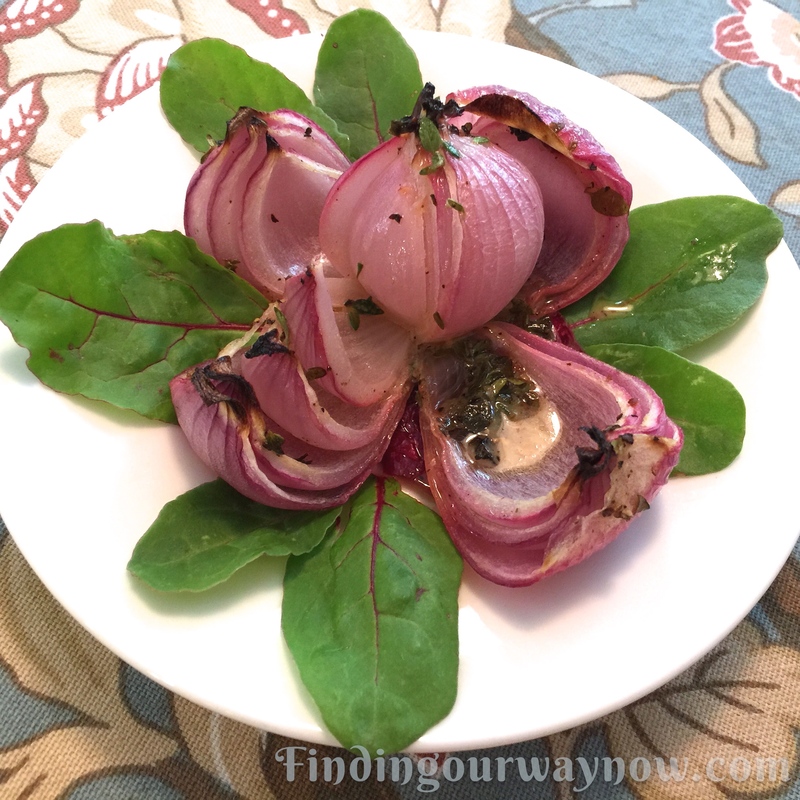 These roasted onion flowers were really fun to make. They make for a beautiful and luscious presentation, especially for special dinner guests. I hope you enjoy them as much as we do. To prepare the onions, cut off the top of the onions, trim a small amount off the root ends keeping the root ends intact so the onions will sit upright. Peel off the outer layer removing the protective onion membrane. 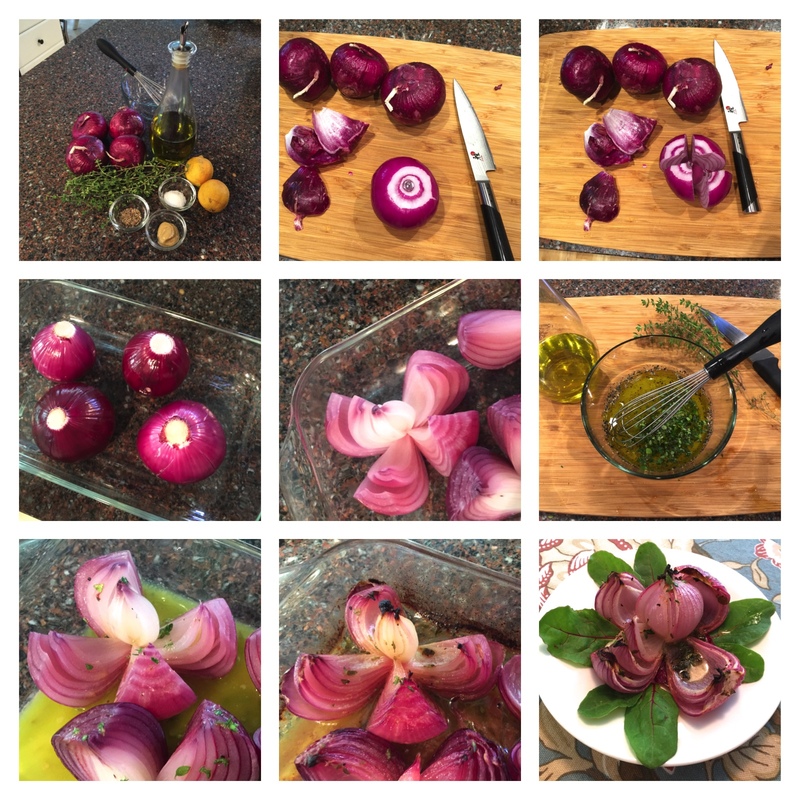 Using a sharp pairing knife, slice the outer layers of the onion from the top to ½ inch from the root end, leaving a small part of the core of the onion intact. Repeat this same step 3 more times around each onion. Prepare the dressing by combining the lemon juice, mustard, thyme, salt, and pepper in a small bowl. Whisk in the olive oil to emulsify and set aside. Place the cut onions, root side up in an ovenproof glass baking dish. Microwave the onions on high for 5 to 6 minutes. Then turn the onions over with the root side down. Spoon the prepared dressing into the cuts and over the prepared onions, making sure they’re evenly coated. Bake for 40 to 45 minutes. Basting them every 10 minutes or so. Bake until the onions are tender and a bit crispy around the edges. Remove them from the oven, basting them one final time with the juices from the pan. 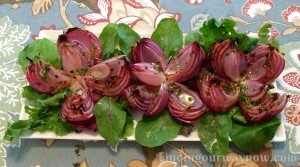 On a platter or dinner plate or side dish, arrange the baby spinach leaves as a garnish for the baked onion flower. Using a slotted spoon, carefully bunch the onion together and move it from the baking dish to the bed of baby spinach leaves, letting it fall open. Drizzle a little of the leftover pan juices over each onion, season to taste with salt and pepper and serve. 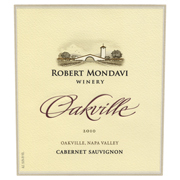 Beverage Pairing Suggestions: If you pair this luscious side dish with a good steak or pot roast I would suggest an excellent Cabernet Sauvignon such as Robert Mondavi Oakville Cabernet Sauvignon. Notes: You can easily increase the recipe, just remember to increase the dressing accordingly. I know what you’re thinking. Wow, do they ever take a long time to cook. 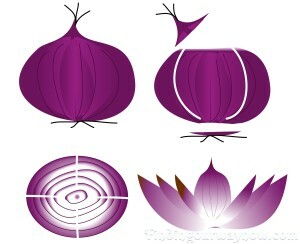 Onions, by their chemistry and physical nature, require a long cook time. Cutting the onions was interesting. I tried many techniques and this was the one that worked the best to offer a flower like appearance. The dressing makes this recipe, so making more than is called for isn’t a bad idea. 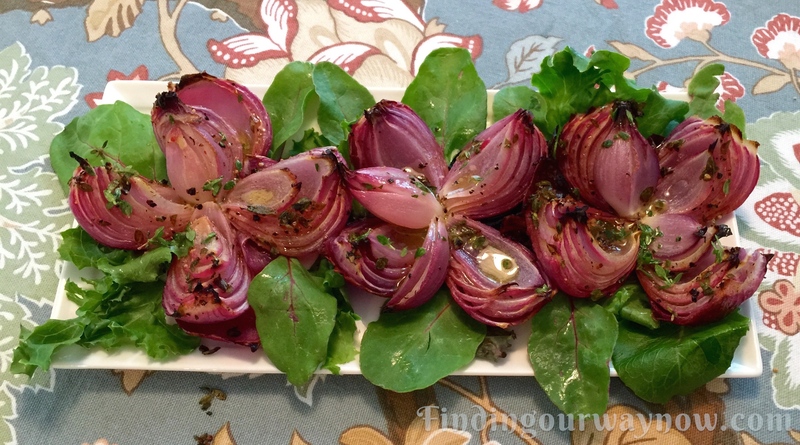 These Roasted Onion Flowers are not only pretty to look at they taste just as wonderful as they look. The sauce is to die for. 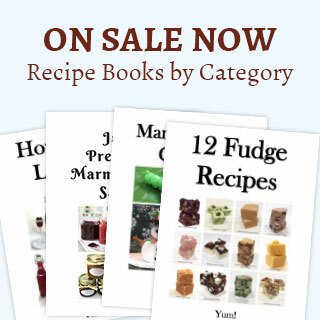 These go especially well with a nice piece of red meat or my Crockpot Pot Roast. Add a salad, crusty bread and maybe some Smashed Lemon Potatoes and you have a meal fit for a king or queen.